Be the first to share your favorite memory, photo or story of Vincenzo. This memorial page is dedicated for family, friends and future generations to celebrate the life of their loved one. Vincenzo Urso, age 88, passed away suddenly on January 30, 2019. Vincenzo was the beloved husband of Caterina, nee Raia, for 68 wonderful years; loving father of Maria (Roman) Kowal; cherished grandfather of Dr. Michael (Paula) Kowal; dearest brother of Luigi (Lill) and Mario (the late Josephine) Urso, Petrina (Frank) Cassata and the late Rosaria (the late Antonino) Calzatini; fond uncle of many. Vincenzo was a member of Society of Maria SS. Lauretana of Altavilla Milicia in Chicago. 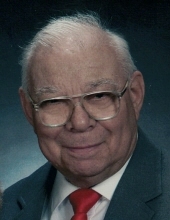 Visitation Monday, February 4, from 3:00 p.m. until 9:00 p.m. at Cumberland Chapels 8300 W. Lawrence Ave., Norridge, IL. Funeral services will begin at 9:30 a.m. on Tuesday, at the funeral home, and will then proceed to St. Catherine Laboure Church in Glenview for Mass at 11:00 a.m. Entombment will follow at All Saints Mausoleum. Info 708-456-8300. To send flowers or a remembrance gift to the family of Vincenzo Urso, please visit our Tribute Store. "Email Address" would like to share the life celebration of Vincenzo Urso. Click on the "link" to go to share a favorite memory or leave a condolence message for the family.